Nichijou ep11 is delayed because I woke up this morning to find the release of Shiki ep20.5 (taking place between ep20 and ep21, obviously). This is a little random, since I didn't do episode reviews on Shiki (or a final review, for that matter), but I really couldn't pass up the chance to talk about it. I wonder if they're missing any characters; I can't remember. 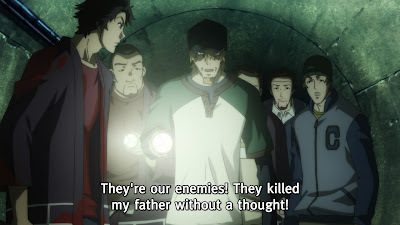 This episode focused on the villagers breaking into the irrigation system, where a large number of shiki had been hiding, and showed far more violence than I recall the surrounding episodes depicting. I suspect it might be because this was a DVD release, so the violence didn't need to be toned down. 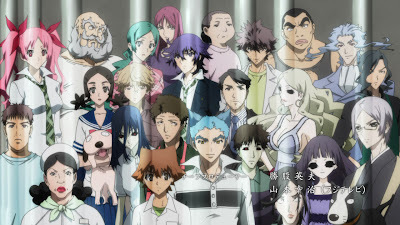 Two main characters were depicted, the shiki Nao and the human Hasegawa. 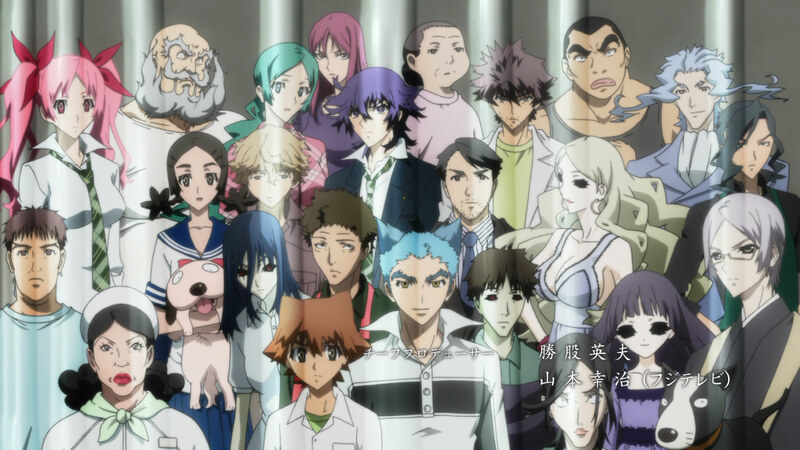 This was as incredibly emotional episode, with the unspoken feelings of the characters clearly conveyed. The thought process is very chilling - and very human. The episode began with the shiki climbing into the underground system, and the villagers following after the OP. The sudden contrast between the relative hesitancy of the villagers from before ep20 and the sudden ease afterwards was kind of explained; the villagers depicted here were still hesitant about killing the shiki. They first began to identify the bodies they found, until the "leader" announced that they shouldn't bother attempting to sympathize with demons that had no emotions. It was quite a lot of propaganda, ultimately, considering one of the shiki cried out in pain (but, by then, the group had already banded together against the other kind). After the initial scenes, where the two parties fully got into their war, a lot of violence and attacking followed. It was interesting to see how similar the paths of both sides were; when first "born", a lot of the shiki were shown to have held onto their "ethics" and hesitation, unwilling to kill the prey given to them. However, when the intense thirst and need for survival struck, they followed their instincts and, for better or worse, adopted to their new lifestyle, to the point where the majority of them no longer think anything of attack humans. Meanwhile, the villagers beginning the hunt were initially very hesitant to kill what they deemed their neighbours. However, as they began seeing that the shiki would attack indiscriminately - and had already done so for months - they began seeing the enemy as an entirely different species, as removed from themselves as possible. In the end, it really is all about the mental conditioning. I never really figured out what the eyes really meant. 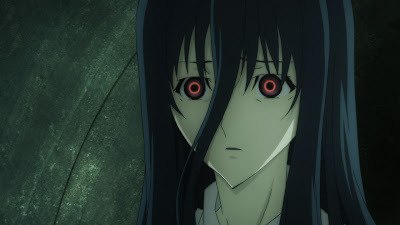 Nao's predicament had been depicted slightly in the original airing, as it was made clear that she had a lot of remorse and grief in her new life. She had adjusted to her new life and attacked her family under the idea that they would arise after dying. However, none of them did, leading to her re-evaluating what it really meant to become a shiki. She, having come from a difficult background, had married into an extremely nice family, where everyone treated her like one of their own without discrimination. In order to share the "afterlife" with them as well, she let her husband be killed by her comrades, and personally took care of her nephew and parents-in-law (she also had siblings-in-law, but I can't remember who killed them). She had hypothesized that she had "evil" in her even as a human, which is what allowed her to become a shiki - but her family, made of pure goodness, had given their lives in vain. This episode capitulated on her grief, leading to her death at the end. 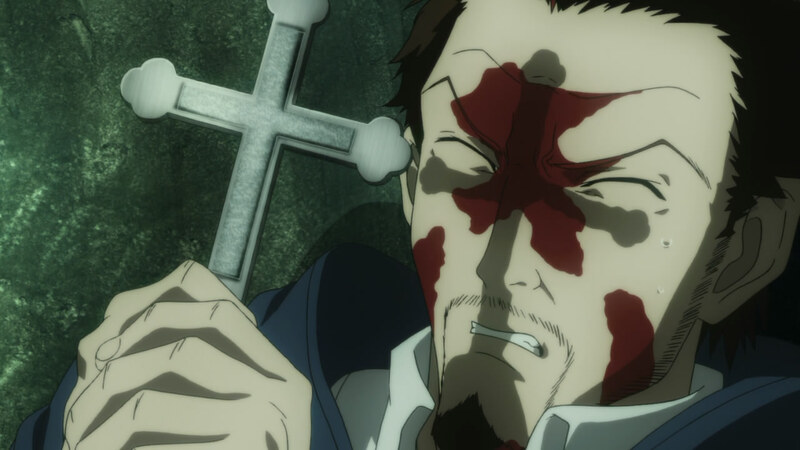 If there's another Shiki, I hope they explain the religious paraphernalia more. On the other end of the spectrum, Hasegawa didn't buy into the "they're demons" theory, unwilling and (until the end) incapable of killing. He and his wife, it was revealed, lost their child in an accident and moved to the village. They had tried their best to fit in, seeing the village as full of very nice people. 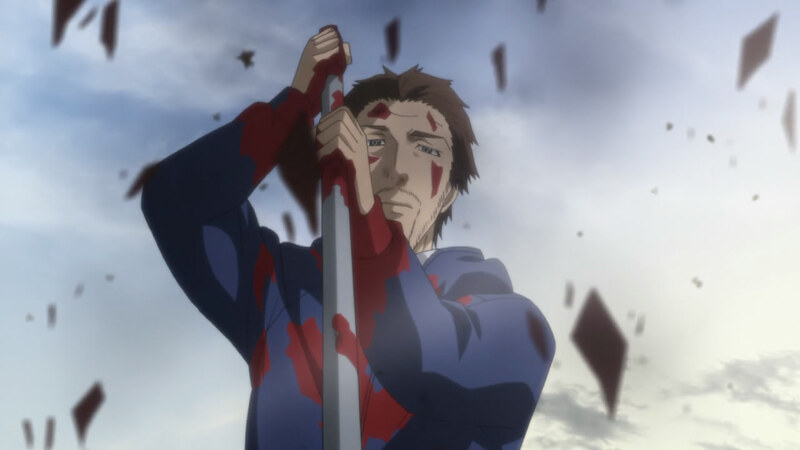 (These words from the past were spoken over scenes of the villagers, covered in blood, carting dead shiki around. It was very delicious - and obvious - symbolism.) He was unable to grasp any feelings of retribution, disgust, or violent fear (some of the ones that gripped the other villagers), going along with the killings because he saw that he was a part of the village but unable to actually kill. 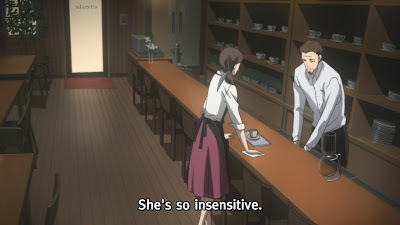 Nao's bitter end came when she, in the end, showed her flaws as a normal human. She regretted having killed her family to the point of thinking that the current occurrences around her were karmic punishment - regardless of that acceptance, the idea of death still scared her. She kept seeing visions of her dead family members and screaming in tortured angst. When push came to shove and the shiki were being pulled out of their single-file line, she literally kicked the one behind her when he gripped onto her leg - and, when it was her turn, she held on to the one in front of her so desperately that he bled. These are all human traits - the ability to accept side-by-side with the ability to deny - and it continued driving home how similar the shiki are, underneath it all. Hasegawa's administration of euthanasia is a touchy subject on many levels. When the villagers ran out of stakes, they remembered how the shiki were vulnerable to sunlight and simply brought them out, tying them to trees or attaching them to metal bars. When the sun came out, the villagers simply watched, taking a break from their hours of hard work, as the shiki began burning. 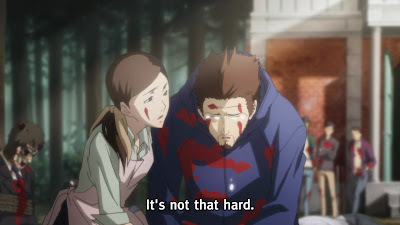 This scene was Hasegawa's resolution - he picked up a bar and walked to every shiki, stabbing him so that death came swiftly. Watching his mercy killing was extremely stirring; this was definitely one of the most memorable scenes for me in the entire anime. His tears at the end were truly of resignation; he and his wife had wanted to fit into the village, letting go of their grief over their child in order to be happy in new lives, and so he knew he had to follow the currents. I wonder if the background is a little too gory. This episode was extremely enjoyable due to the fact that, despite the elapsed time, I still feel very strongly about Shiki. Due to its status as an insert instead of a stand-alone, someone who liked Shiki less might have to do some background reading or re-watch some episodes before digging into this one. The absence of Natsuno and Toshio wasn't especially felt; this episode was able to keep going due to the strength of the two focus characters and the subject matter itself. I'm almost on the verge of saying that this episode should be seen at the end, out of chronological order, because it brings back a taste of the calamity after a subpar ending, allowing the series to rise once again.